As promised, here are the pictures of one of the other most exciting things we did in Colorado last week. After watching the other rafters pass below us at Royal Gorge, we knew instantly we wanted to do that exact same thing. 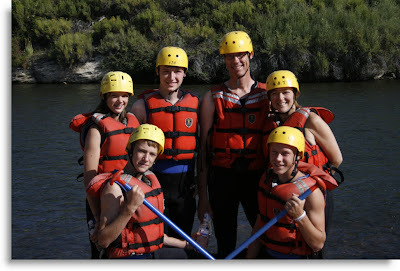 And so, a mere 24 hours later there we were... suiting up for our 3 1/2 hour white water ride down the Arkansas River. Here's a brief sample of the 25 pictures the designated photographer took of us going down Sunshine Rapids, one of the largest level 5 rapids in all of North America. Yes we were brave, yes we gritted our teeth (ok mostly *I* did) and YES - WE HAD A BLAST! I highly recommend this to anyone who ever gets the chance. It was exhilarating when the water was fast, and magically beautiful when the river was lazy. I thought Colorado was amazing on our honeymoon, and now 20 years later I'm blown away all over again. I think I've found my new favorite place. Wow! That looks exciting and scary! Was it a lot of work? Were you ever really afraid the raft might flip? I'd worry that all that white water rapids stuff would just WHIP the paddle right out of my hands. The rest of the raft would thus be doomed to a watery grave, after paddling in circles over and over and over again. Looks like a blast! But way to scary for me! Jeff, your expression didn't change in any of these photos. How do you do that? In the last larger photo, what were you all looking at? It looks like a total BLAST! I love Colorado as well, that's why I live here - lol. Fun pics, Jeff! elizabeth - Not really, those rafts weigh a ton and are very flat on the water. In fact, the instructor kept trying to get ours to do a "wheelie" by aiming us head on into large sloped rocks so our front end would pop up. But he was nice enough to ask how we felt about death first. janna - That's a good point, but can you believe they bring EXTRA paddles with just for that very reason. I know, sneaky. drowsey - Come on... it's ok to live a little. Which is ironic to say because that's about how long you might live. carlae - I had that same face because they lost me overboard on an earlier set of rapids, and they thought it would look bad for the pictures so they photoshopped me back in the boat there. We were all looking at Austin because we was the "lead" rhythm setter. In a raft you all have to move forward/backward as one synchronized unit so you have to follow one person. The guide said we were really good at it and so we ended up naming our team the "Paddling Prodigies." But that was later... in the beginning we called ourselves the "Pathetic Paddlers." danelle - If I don't get my job here we may end up as neighbors! Hey, wanted to apologize for not visiting sooner. I did get your comment that you mentioned me in your "Happiness Is" post and I read it and loved it. Thanks so much... and I'll try to come around more often! Pathetic Paddlers. Ha! That'd be me. The pics are great, Jeff. I bigified them all and you can really see the experience on your faces. Holy cow I'm impressed. So people do lose paddles on the way down, right? I could see me climbing in and someone asking what the extra 20 paddles were for. "These would be for Kathy." That looks awesome. I wanna do it! I'd be scared, but exhilarated. Is that how you felt? Man, I WANNA DO IT! Do we have white water rafting in Illinois? I'm guessing not. kathy - Funny. They'd probably have to tow a 2nd raft full of paddles just for you. Ha-ha-ha. jd - It looks like you can ride the Big Vermillion River in Oglesby, Illinois. And yes... it IS scary AND exhilarating at the same time. And the best part is, it doesn't matter if you pee your pants! Looks like a great time, and since you tackled the white-water rafting, bungy jumping off the Royal Gorge would be a piece of cake, right? Those are great pictures. It looks like a lot of fun. 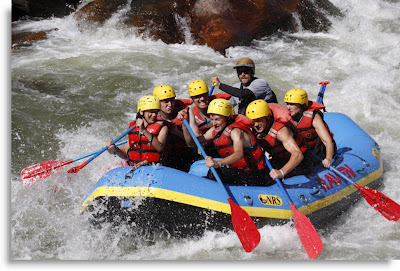 I tricked my wife into white water rafting once. That card is played out.